Make a Thinking of You card to cheer someone who is feeling blue. You'll be glad you did! When a friend is feeling alone and buffeted by life, and they seem not sure if anyone is thinking about them, help them to stay strong and to feel loved. 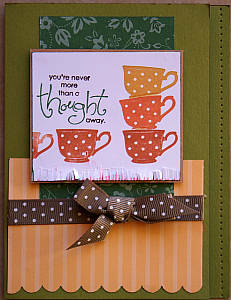 Make a special Thinking of You Card to cheer them. HINT: There is no need to wait for a special occasion or event to give a handmade greeting card to someone important in your life. Why not make a few of these greetings up for those times when you need one on short notice? I have been doing that lately and keeping them in my 'Forget Me Not' keeper box. Then when I need to send something quickly, I can just reach into my card keeper box and take out something I rubber stamped with care. This card ironically took some thinking for me. I spent some time trimming the main image, trying the designer series paper first with one side showing, then with the other, testing to see if I liked the small piece of paper off centre, and then if I wanted it centred or toward the top or toward the bottom. I just kept playing with the elements until I was happy with the result. Working without a sketch is sometimes slower but the result can be very satisfying. This time, I worked without a sketch, but you could use my card to make your own if you like it. For this card, I started with a base that was folded 1cm (about 1/4") off centre so the bottom layer of the card overlapped the front. Then I used some Whisper White cardstock and Earth Element inks (retired) to rubber stamp the little stack of cups using the masking technique. 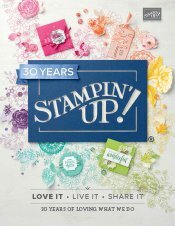 Then I used my Stampin' Write! markers to colour different words of my sentiment stamp before placing the image alongside the cups. I used my little paper scissors to make a fringed edge along the bottom. You could also use fringing scissors to create the same effect. I inked the edges of all papers used on the card with sponge daubers or by running the edges of the cardstock pieces along an ink pad. Next I scalloped the yellow striped paper, then adhered the ribbon and tied the bow before sticking it to the card face. I added the green flowered paper next, tucking the bottom edge under the ribbon, then over that I popped up the mounted main image with some Stampin' Dimensionals. Last I used my Paper Piercing mat and tool to add a row of punched holes along the right edge of the card, and I finished off the project by inking all the edges of the main card. Then all I had to do was add a special message to the inside of the card, stamp a cup on the envelope, and give my greeting to my friend. 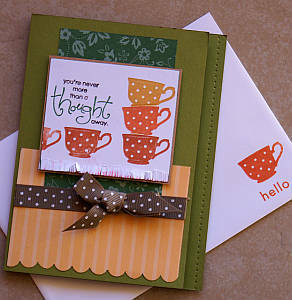 Maybe you will be inspired to make your own Thinking of You Card next time a friend or family member needs some moral support. I hope so. 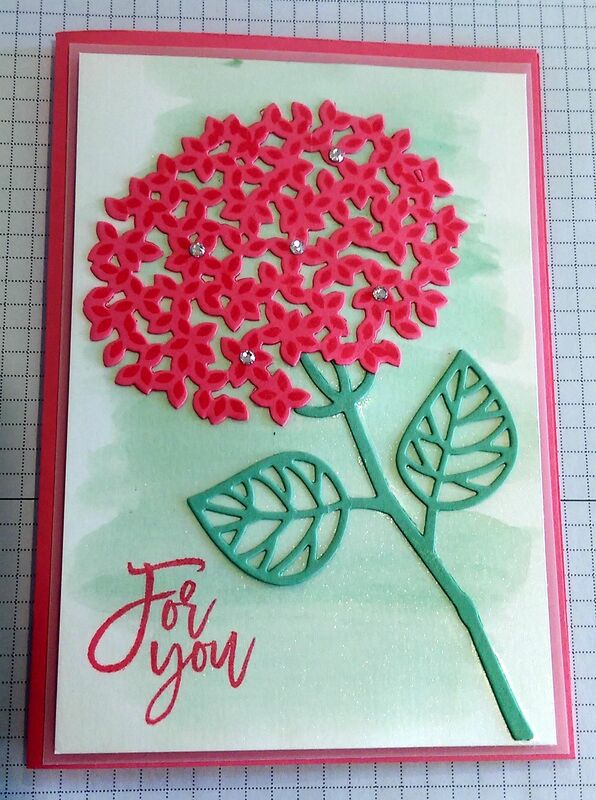 This card was made with the Thoughtful Branches stamp set, in Watermelon Wonder and Mint Macaron. I layered the top layer with Vellum. The flower head was stamped first in Watermelon Wonder before being cut out with coordinating framelits. I washed the background with Mint Macaron by using my Aqua Painter and some water with some reinker and allowing it to dry before popping the flower head up on Stampin' Dimensionals. The stem and leaves cutout is adhered with the Fine Tipped Glue Pen.